These days, our cellphones are more necessary than ever, as you can nearly control your entire career from one (considering most musicians don't exactly have offices). Aside from the obvious function of, you know, calling, phones are easy access to email, texting, the web, and the ever-present social media, all of which you need on a fairly constant basis if you're out on tour. While they're incredibly helpful, and it's difficult to live without one, using your phone for so many different things has one serious drawback: your battery. Unfortunately, cellphone batteries haven't come as far as the phones they power, and it's really easy to drain your life source in no time. Since recharging isn't always an option while you're traveling from show to show, here are six ways to help prolong your phone's battery life. There's a lot of downtime when traveling – waiting in airports, driving, and even at night in hotels, motels, or whatever couch you might be crashing on – and you're sure to be listening to a lot of music. If you're like most people, you now access much of the music you listen to on Spotify or through other streaming sites. The only trouble with those (when it comes to your phone) is that they can kill your battery. Streaming music, either from a platform like Pandora or even from YouTube, is especially taxing on your phone’s reserves. Instead, do your best to download as much music as possible onto your phone, which doesn't drain as much power. Though you may not realize it, many of the apps on your smartphone are drawing power even when you're not using them. Plenty of apps continue running even when they're not being used, thanks to features that require them to follow where you go or track things online. Open your phone's settings and look at which apps are currently pulling from your precious power reserves, and you’ll see what you then need to go and turn off manually. This one may seem obvious, but it may surprise you just how much this can actually help. If you're not out in direct sunlight (which can make your phone's screen difficult to see when not fully illuminated), try turning the brightness down, if even just a bit. I almost always have my screen’s brightness at 25 percent, and I've gotten completely used to it. The amount of light your screen is emitting can usually be adjusted in just a second or two, so no worries if you need to bring it up for any reason. WiFi is a great way to limit the amount of data your phone is pulling – which can also be bad for your battery – but only if you're in a place with a strong signal. Many people (myself included) forget to turn off WiFi when they're not actually using it, and this can really hurt your power supply. Make sure to manually switch off the option that seeks out a signal immediately after using the internet. 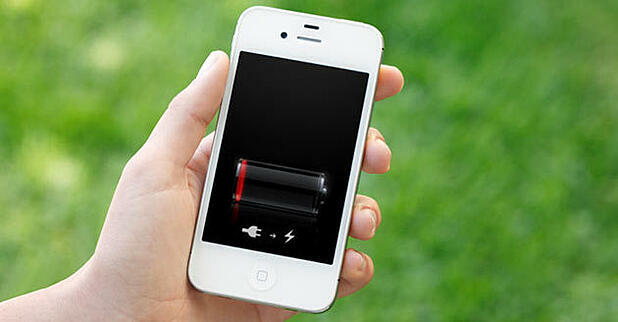 While nothing will work quite as efficiently as plugging your phone into the wall, that's not always an option. Instead of frantically searching for an outlet or leaving your phone unattended at times, bring an external battery along with you. These days, there are plenty of affordable and extremely portable options, and most can be used with any phone. A quick search on Amazon shows plenty of batteries under $25. I personally have a Mophie, and an even smaller, slimmer one that's about the size of a tube of lipstick. It's really come in handy when going from meeting to meeting or spending a day at a music festival, just to name a few instances. If you're traveling the country on tour, you're likely to drive through plenty of places where service isn't ideal, if available at all. If you're driving, asleep, or simply don't need to be using your phone (it is okay to pull yourself away from time to time), try putting your phone in airplane mode. This way, your device won't automatically search for service or WiFi, and it'll save your battery quite a bit. When you do enter an area with plenty of service, your battery won't be spent from looking for it, and your phone will be ready to go.